Our one step installation on standard faucets creates fun and whimsy with an otherwise ordinary household item you use every day. This whale water faucet fountain eliminates paper cups as well. Saving money and saving time for anyone. Whether you are introducing the life long habit of brushing your teeth to a toddler or chasing up older kids before bed this faucet fountain can make brushing fun and amusing. At Jokari we believe you can mix fun and function, we know you'll enjoy this faucet fountain! GREAT FOR KIDS: This child friendly faucet fountain turns a regular sink into a fun water fountain. Also acts as a faucet guard, turning your faucet into a cute plastic whale instead of hard metal. 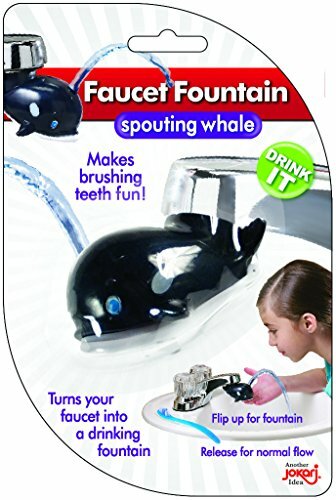 EASY TO USE: Fits over most existing faucets, just lift the whale's mouth up and you've transformed your faucet into a fountain, put the mouth back down and it's a faucet again. MAKE BRUSHING FUN: Take tooth brushing to the next level with this whale fountain. Makes an ordinary task fun and whimsical. "ELIMINATE PAPER CUPS: Drink right from the faucet with the clever water fountain design. No more buying paper or plastic cups when someone wants a quick drink. Does not interfere with normal faucet use if you need to wash dishes or hands. "